Eagle's syndrome is not an uncommon condition, but less known to physicians, where an elongated styloid process or calcified stylohyoid ligament compresses the adjacent anatomical structures leading to orofacial pain. Diagnosis is made with appropriate radiological examination. Nonsurgical treatment options include reassurance, analgesia, and anti.inflammatory medications; and the surgical option includes a transoral or external approach. Here, we present a case report of a male patient, of age38 years, with a chief complaint of unilateral atypical orofacial pain on the right side of his face radiating to the neck region, for the last two months. Since 1937, atypical/nonspecific orofacial pain, secondary to calcification of the stylohyoid ligament or elongated styloid process, has been known as the 'Eagle's Syndrome'. The elongated styloid process is a rare clinical condition, which frequently presents with indistinct cervicofacial pain, foreign body sensation in the throat, dysphagia, unilateral facial pain, with radiating pain to the neck, and referred otalgia. The incidence of Eagle's syndrome varies among the population, but in 4% of the general population it is evidenced. Other investigators mention that 0.04 - 0.08% of the population suffer from the syndrome, whereas, 1.5-3% of the adults have some of the complaints due to a pathology of this apparatus. It is generally asymptomatic, occurs in adult patients, with the age ranging from 30 to 50 years, and females are more commonly affected. Styloid process elongation can occur both unilaterally or bilaterally., Here, we report a case of the Eagle's syndrome presenting with symptoms of unilateral atypical facial pain, which makes it a case to emphasize on for discussion. Generally, the mainstay of treatment for this is surgical. Here, we report a case treated with medication and physiotherapy. A 38-year-old male presented with a primary complaint of pain in the right side of his face since two months [Figure 1]a. The pain was of a moderate and intermittent type that radiated to the right temporal and neck region and was associated with restricted neck movements on the right side. The patient revealed that he was under stress, as he was concerned about his change of job since two to three months, which aggravated the pain, and it was occasionally associated with disturbed sleep. The previous medical history was unremarkable, but the dental history included uneventful extraction of the lower right back tooth, three months prior. Extraorally, on digital palpation, tenderness was present in the right tonsillar fossa region, with a hard bony mass [Figure 1]b. The examination of the contralateral side was normal. The bilateral temporomandibular joints showed normal movements. Intraoral examination showed missing teeth #46 and #48, with mesioproximal caries in #47 [Figure 1]c. A provisional diagnosis of Atypical Facial Pain with elongated styloid process was made. A panoramic radiographical examination demonstrated elongation with mild calcification of the bilateral styloid processes [Figure 2]. Furthermore, a plain Computed Tomography (CT) scan of the base of the skull also showed elongated bilateral styloid processes, of which the right side measured about 4.8 cm and the left side measured 4 cm [Figure 3]. After thorough radiological and clinical correlation, the final diagnosis of the Eagle's Syndrome was specified. Initially, a positive lidocaine infiltration test with 1 ml of 2% lidocaine was given to the tonsillar fossa region, with subsequent impermanent subsiding of the patient's symptoms. In addition, he was advised to avoid stress and was put on anxiolytics like diazepam 0.25 mg for five days. As the patient refused surgical treatment as the first choice, he underwent non-steroidal anti-inflammatory local treatment and Transcutaneous Electrical Nerve Stimulation (TENS) therapy every four to five days, with extra benefit. After five months of follow-up the patient was devoid of any symptoms. The normal length of the styloid process was individually variable, but in a bulk of the patients it was between 2.5 and 3.0 cm. However, according to Balcioglu, the mean length of the styloid process of the cadavers and dry bones was 40.0+/- 4.72 mm, and was to be designated as the Eagles syndrome. The incidence of the elongated styloid process was 3.3%, and it had a female dominance. The average length of the elongated styloid process was 36.06+/- 6.12 mm. The results of their study might assist clinicians in the diagnosis of Eagle's syndrome. It was supposed that an elongated styloid process could be caused by: Congenital elongation of the styloid process due to perseverance of the cartilaginous analog of the styloid, calcification of the stylohyoid ligament by unfamiliar means, and growth of an osseous tissue at the insertion of the stylohyoid ligament. Genetic polymorphism and early onset of menopause had also been suggested as causes of stylohyoid ossification. The pain in the Eagle syndrome often mimicked glossopharyngeal neuralgia, but it was classically more dull and constant, even though there have been reports depicting it as a sharp intermittent pain all along the path of the glossopharyngeal nerve. The main symptoms of the exemplary styloid syndrome include: Reduced ability to open the mouth, increased salivation, a foreign-body sensation, pain in the pharynx, and tinnitus. Nevertheless, an elongated styloid process or a calcified styloid ligament usually does not cause characteristic symptoms. Steinmann anticipated diverse theories to explicate ossification. These were: (a) 'Theory of reactive hyperplasia' – trauma can cause ossification at the end of the styloid process down the length of the styloid ligament, as the styloid ligament contains remnants of its connective tissue and fibrocartilaginous origins, which are the potential for ossification remains; (b) 'Theory of reactive metaplasia' – an abnormal posttraumatic healing response initiates calcification of the stylohyoid ligament; and (c) 'Theory of anatomic variance' – the early elongation of the styloid process and ossification of the styloid ligament are anatomical variations that occur without recognizable trauma. Eagle's syndrome is treated equally well by using surgical and nonsurgical methods. A pharmacological approach by transpharingeal infiltration of steroids or anesthetics in the tonsillar fossa has been used, although styloidectomy is the surgical treatment of preference, which can be performed via a transoral or extraoral approach. Dentists have a prime role to play in the diagnosis of Eagle's syndrome, as the presenting symptoms in a majority of the cases direct patients to a dental consultation. Clinical palpation of the tonsillar fossa supplemented with plain radiography along with diverse views and a CT scan can aid in making a definite diagnosis. Alertness of this syndrome is crucial to all health practitioners concerned in the diagnosis and treatment of the relevant pain. In patients with undiagnosed neck and/or facial sporadic pain, an elongated styloid process might be suspected, and hence, it would be worthwhile to conduct auxiliary clinical and radiological investigations. Casale M, Rinaldi V, Quattrocchi C, Bressi F, Vincenzi B, Santini D, et al. Atypical chronic head and neck pain: Don't forget Eagle's syndrome. Eur Rev Med Pharmacol Sci 2008;12:131-3. Prabhu LV, Kumar A, Nayak SR, Pai MM, Vadgaonkar R, Krishnamurthy A, et al. An unusually lengthy styloid process. Singapore Med J 2007;48:e34-6. Politi M, Toro C, Tenani G. A rare cause for cervical pain: Eagle's syndrome. Int J Dent 2009;2009:781297. 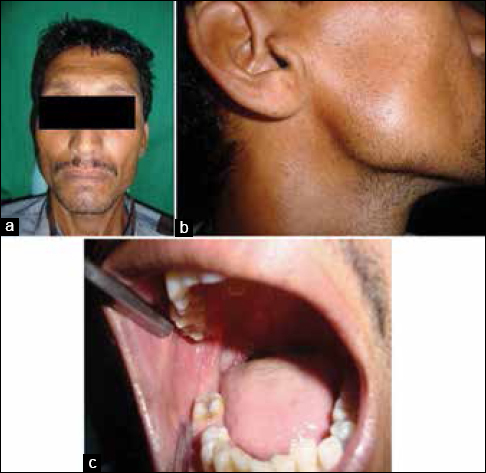 Sadaksharam J, Singh K. Stylocarotid syndrome: An unusual case report. Contemp Clin Dent 2012;3:503-6. Vougiouklakis T. Overview of the ossified stylohyoid ligament based in more than 1200 forensic autopsies. J Clin Forensic Med 2006;13:268-70. Paraskevas GK, Raikos A, Lazos LM, Kitsoulis P. Unilateral elongated styloid process: A case report. Cases J 2009;2:9135. Blackett JW, Ferraro DJ, Stephens JJ, Dowling JL, Jaboin JJ. Trigeminal neuralgia post-styloidectomy in Eagle syndrome: A case report. J Med Case Rep 2012;6:333. 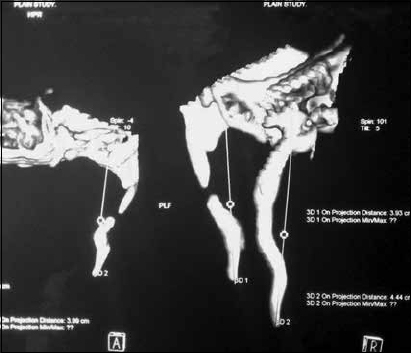 Balcioglu HA, Kilic C, Akyol M, Ozan H, Kokten G. Length of the styloid process and anatomical implications for Eagle's syndrome. Folia Morphol (Warsz) 2009;68:265-70. Buchaim RL, Buchaim DV, Shinohara AL, Rodrigues AC, Andreo JC, Ahmed FJ. Anatomical, clinical and radiographic characteristics of styloid syndrome (Eagle syndrome): A case report. Int J Morphol 2012:30:701-4. Németh O, Csáki G, Csadó K, Kivovics P. Case report of a 27-year-old patient suffering from Eagle's syndrome. Oral Health Dent Manag. 2010;9:140-3. Hyginus TC, James RS, Belentani FM, Birth GM, Maia MS. Eagle's syndrome: Report of three cases. Arq Int Otorrinolaringol 2008;12:141-4.